Plant Notes: Recent work has seemed to favor expansion of Plectranthus to include Coleus, Solenostemon, and other genera (Pollard & Paton 2001; Paton et al 2004; Zhong et al. 2010). 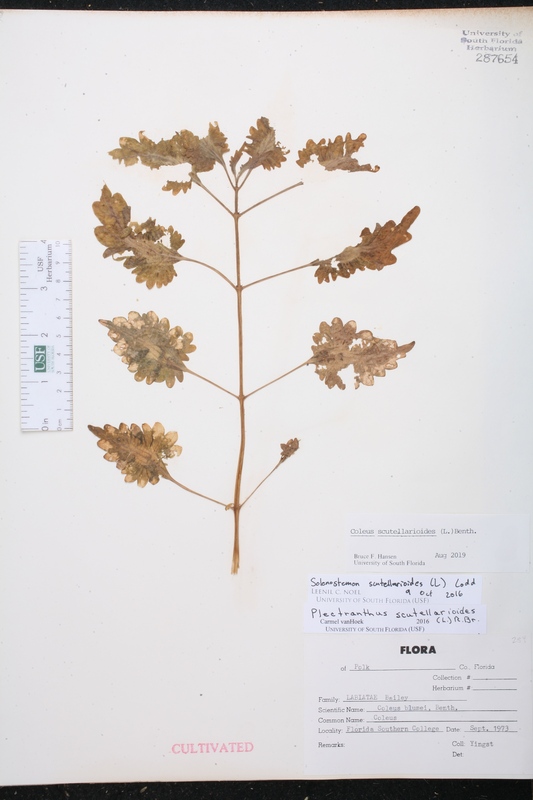 Citation PLECTRANTHUS SCUTELLARIOIDES (Linnaeus) R. Brown, Prodr. 506. 1810. Basionym: Ocimum scutellarioides Linnaeus 1763. Type: INDONESIA: Amboin Island, without data (lectotype: Rumphius, Herb. Amboin. 5: t. 101. 1747. Lectotypified by Merrill, Interpr. Herb. Amboin. 560. 1917. Calchas scutellarioides Calchas scutellarioides (Linnaeus) P. V. Heath, Calyx 6: 51. 1999. 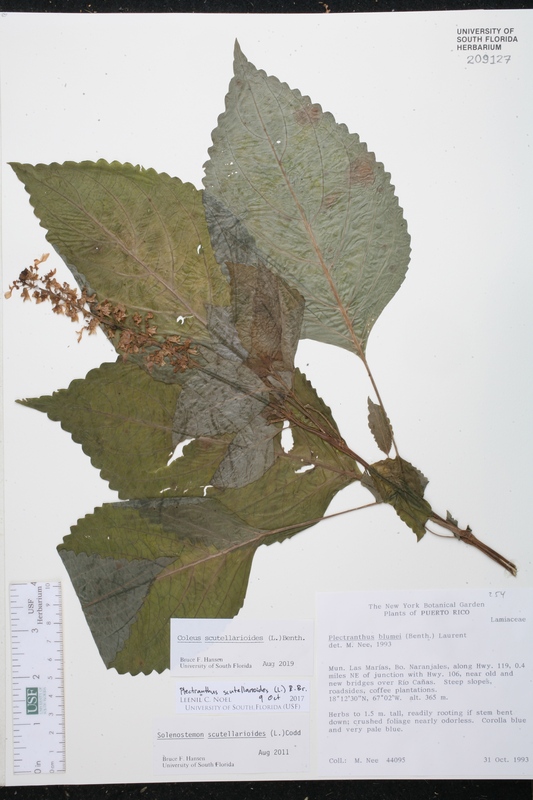 BASIONYM: Ocimum scutellarioides Linnaeus 1763. Coleus scutellarioides Coleus scutellarioides (Linnaeus) Bentham, in Wallich, Pl. Asiat. Rar. 2: 15. 1830. 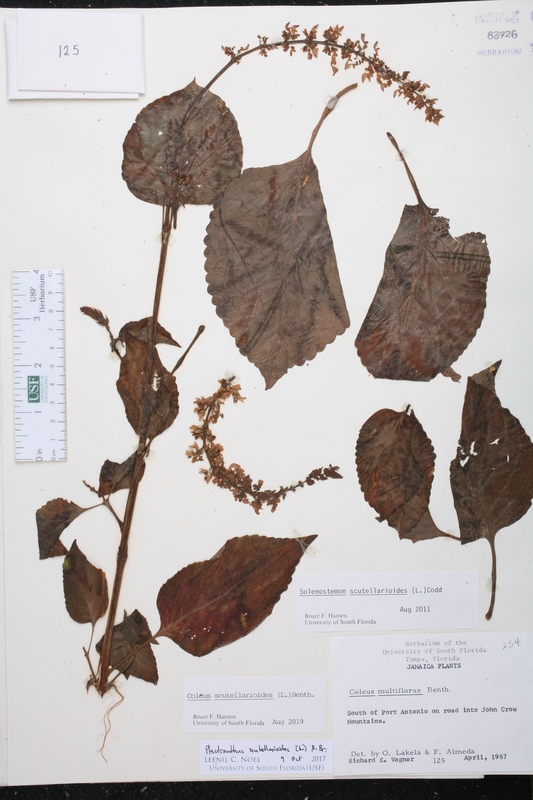 BASIONYM: Ocimum scutellarioides Linnaeus 1763. Majana scutellarioides Majana scutellarioides (Linnaeus) Kuntze, Revis. Gen. Pl. 2: 524. 1891. 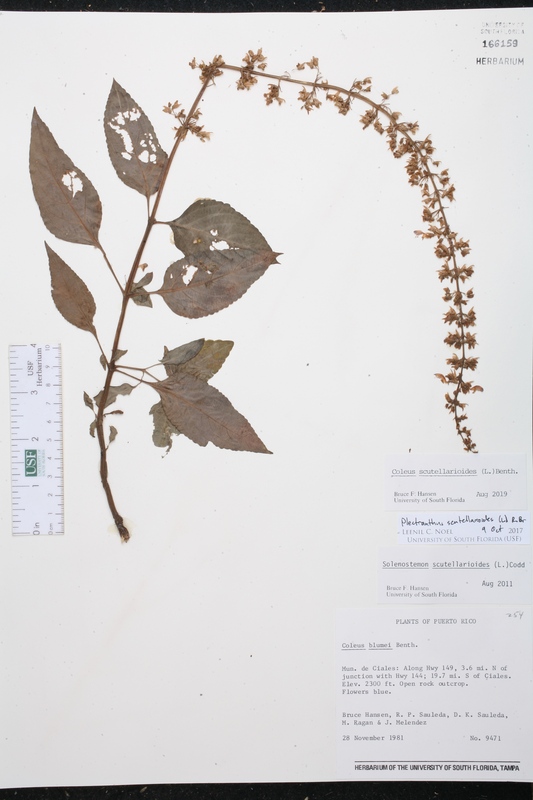 BASIONYM: Ocimum scutellarioides Linnaeus 1763. Ocimum scutellarioides Ocimum scutellarioides Linnaeus, Sp. Pl., ed. 2. 834. 1763. TYPE: INDONESIA: Amboin Island, without data (lectotype: Rumphius, Herb. Amboin. 5: t. 101. 1747. Lectotypified by Merrill, Interpr. Herb. Amboin. 560. 1917. Solenostemon scutellarioides Solenostemon scutellarioides (Linnaeus) Codd, Bothalia 11: 439. 1975. 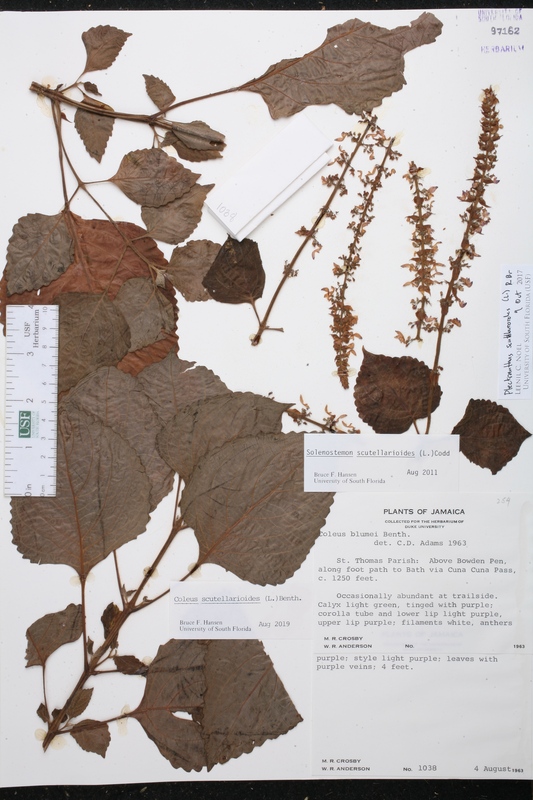 BASIONYM: Ocimum scutellarioides Linnaeus 1763. Calchas acuminata Calchas acuminata (Bentham) P. V. Heath, Calyx 5: 160. 1996. 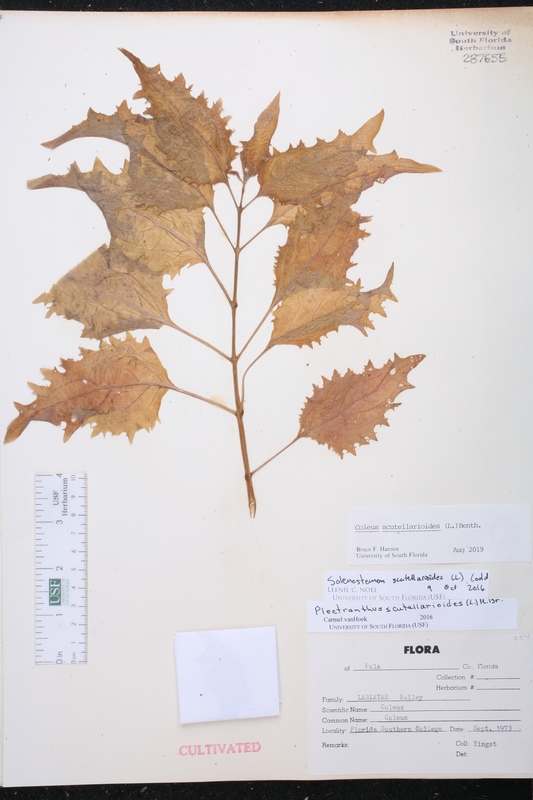 BASIONYM: Coleus acuminatus Bentham 1831. 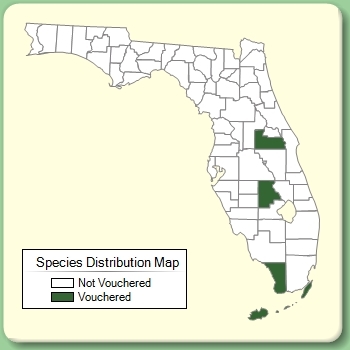 Calchas scutellarioides var. crispipila Calchas scutellarioides (Linnaeus) P. V. Heath, var. crispipila (Merrill) P. V. Heath, Calyx 6: 51. 1999. 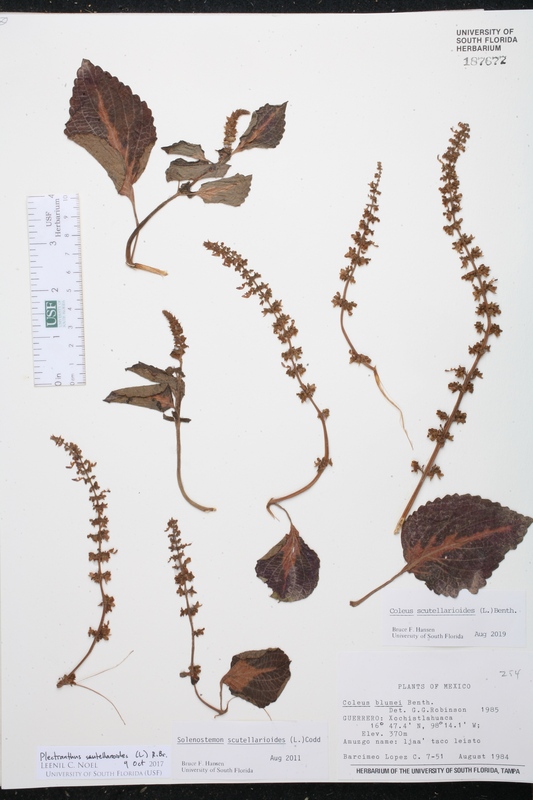 BASIONYM: Coleus macranthus Merrill, var. crispipilus Merrill 1906. Coleus blumei Coleus blumei Bentham, Labiat. Gen. Spec. 56. 1832. 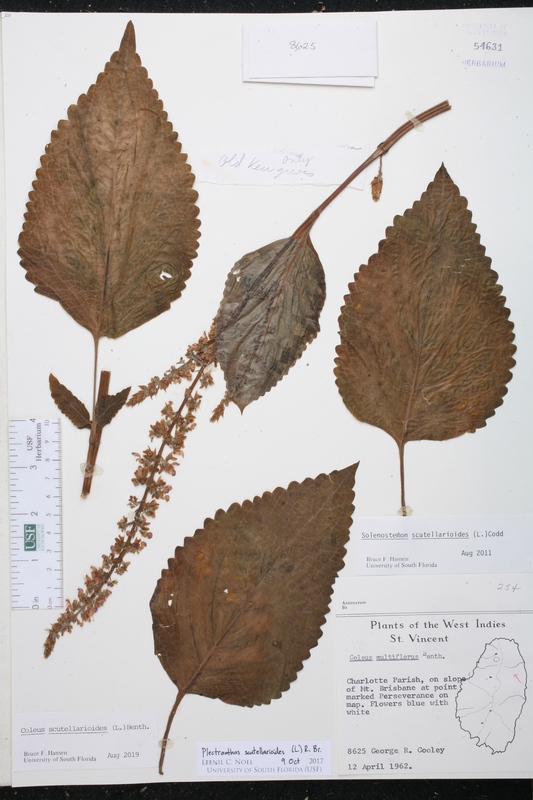 BASIONYM: Plectranthus scutellarioides Blume 1827, non (Linnaeus) R. Brown 1810. Coleus crispipilus Coleus crispipilus (Merrill) Merrill, Philipp. J. Sci. 5: 382. 1910. 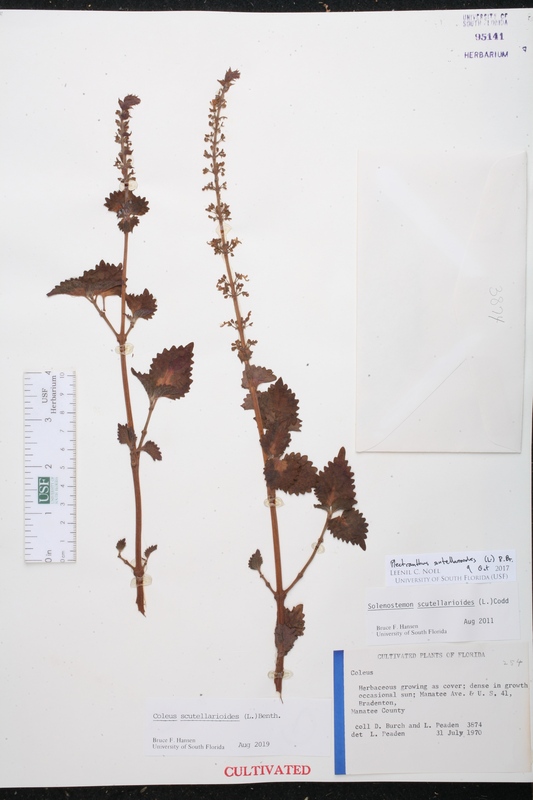 BASIONYM: Coleus macranthus Merrill, var. crispipilus Merrill 1906. Coleus rehneltianus Coleus rehneltianus A. Berger, Bot. Jahrb. Syst. 54(Beibl. 120): 197. 1915. Coleus scutellarioides var. blumei Coleus scutellarioides (Linnaeus) Bentham, var. blumei (Bentham) Miquel, Fl. Ned. Ind. 2: 950. 1858. 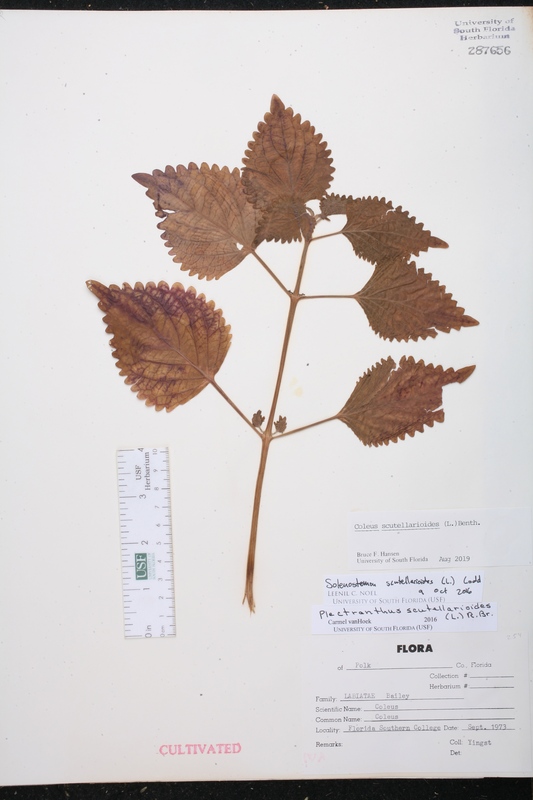 BASIONYM: Coleus blumei Bentham 1832; Plectranthus scutellarioides Blume 1827, non (Linnaeus) R. Brown 1810. Coleus scutellarioides var. crispipilus Coleus scutellarioides (Linnaeus) Bentham, var. crispipilus (Merrill) Keng, Gard. Bull. Straits Settlem. 24: 56. 1969. BASIONYM: Coleus macranthus Merrill, var. crispipilus Merrill 1906. Majana acuminata Majana acuminata (Bentham) Kuntze, Revis. Gen. Pl. 2: 524. 1891. BASIONYM: Coleus acuminatus Bentham 1831. Majana scutellarioides var. blumei Majana scutellarioides (Linnaeus) Kuntze, var. blumei (Bentham) Kuntze, Revis. Gen. Pl. 2: 524. 1891. 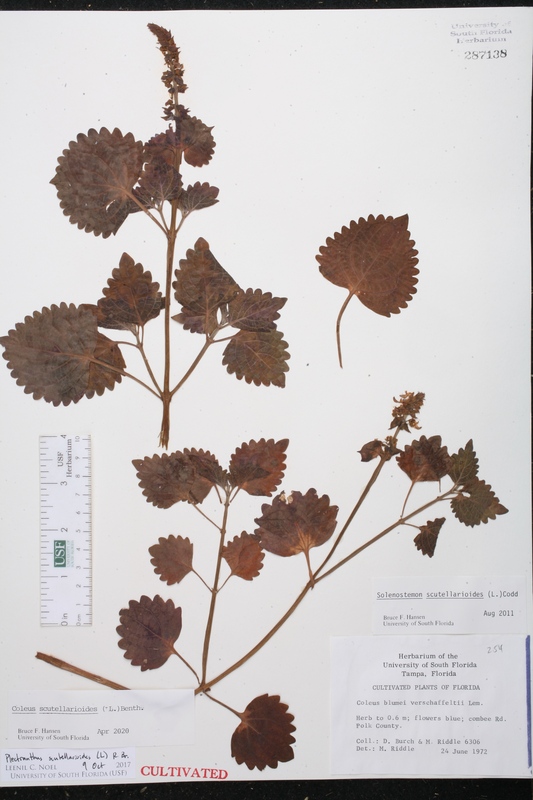 BASIONYM: Coleus blumei Bentham 1832; Plectranthus scutellarioides Blume 1827, non (Linnaeus) R. Brown 1810. Plectranthus blumei Plectranthus blumei (Bentham) Launert, Mitt. Bot. Staatssamml. München 7: 301. 1968. BASIONYM: Coleus blumei Bentham 1832; Plectranthus scutellarioides Blume 1827, non (Linnaeus) R. Brown 1810. Plectranthus scutellarioides Plectranthus scutellarioides Blume, Bijdr. 837. 1827, non (Linnaeus) R. Brown 1810. 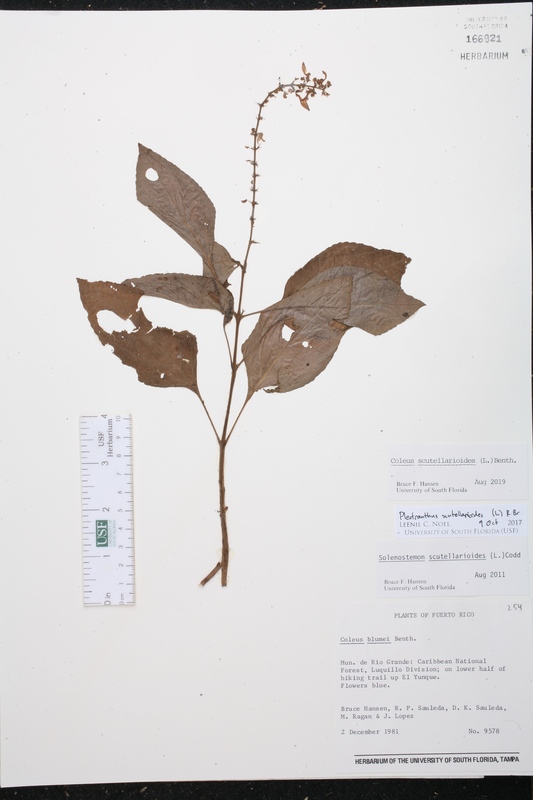 Solenostemon blumei Solenostemon blumei (Bentham) M. Gómez de la Maza y Jiménez, Bol. Secr. Agric. Comerc. Trab., Cuba 22: 127. 1914. BASIONYM: Coleus blumei Bentham 1832; Plectranthus scutellarioides Blume 1827, non (Linnaeus) R. Brown 1810. USA Florida Manatee Co. 31 Jul 1970 D. Burch 3874 CULTIVATED. USA Florida Polk Co. 24 Jun 1972 D. Burch 6306 CULTIVATED.